Reigning UFC Light Heavyweight Champion Jon Jones is one of the most popular mixed martial arts fighters out there today. He’s gone virtual in THQ’s new UFC Undisputed 3 game, along with about 150 other UFC fighters. The 24-year-old is considered by many to be one of the top pound-for-pound fighters in the world. He also knows his way around a controller. Jones grew up a gamer, playing against younger brother Chandler, who’s a defensive tackle at Syracuse University. Jones took a break from preparing for his April 21 bout against Rashad Evans at UFC 145 to talk about video games and life in the UFC in this exclusive interview. What games did you like playing when you were younger? Growing up, I was big on Blitz. Blitz 2000 was my game. I played a lot of that, actually. What else? I played a lot of Splinter Cell. I played a lot of SOCOM: Navy Seals, Call of Duty. Now, I’m a total Undisputed-head. Did you check out EA Sports new Blitz game? You know what? I got out of Blitz, man. I haven’t seen the new one. Do you have a favorite videogame memory from growing up? I can hit you up with some Blitz memories, for sure. Me and my brother, we would always fake one of the fastest guys…one of the quarterbacks from Blitz on the defense. You know how you can’t possibly cross the line of scrimmage until the ball is hiked? We would just sit there with all the DBs, sprinting at the line of scrimmage, waiting for them to hike the ball. We’d get sacks the whole game. It would be so lame to play with us, because we would just sack the guys the whole time. We never played the game of football how it was supposed to be played. But that was pretty fun. So you and your brothers were big gamers? Yeah. I remember my parents used to be, “All right, go to bed.” We would turn the volume off and be in the bed for an hour. We would get up in the middle of the night and play Blitz with no volume. Our parents would just hear us randomly cheering for nothing. They would come in and we’d all be in trouble. Having grown up playing these games, what’s it like to actually see yourself in a game? I’m 24, so I’m still a pretty big kid at heart. It’s great. It’s great to see yourself played in a video game. My brother kind of ruined it for me, because he’s in the NCAA Football game. He’s a college football player. I actually had to play with my brother in a game before I got to play as myself. I kind of got all my excitement out playing as my brother in the NCAA game, but to see myself, it was a cool feeling, too. That guy looks like me, moves like me, and he celebrates like me. He almost fights as good as me. It’s pretty nuts, man. I love it. It’s a great time for me. Can you give us a sense of how popular gaming is amongst the UFC fighters that you know? It’s huge, man. A lot of fighters, we just train, that’s all we do. We work out and eat healthy, and then we need to get off of our feet. During training camps and just around fight camp, you go to any of the guys’ houses, and we’re all congregating playing video games. It’s not like we can drink and go out all the time and be all crazy. We’re pro athletes, and our body means a lot. A perfect way to have a great time and conserve energy is to play videogames. It’s a huge part of today’s society. N ow that UFC Undisputed 3 is out, what impact do you see this game having on getting kids interested in MMA? I just really can see it subconsciously teaching people mixed martial arts, and making those kids and everyone dream to want to be in a game one day. Those guys who join our sport are in their mid-30s, and turn out to be some of the best. Like Randy Couture, who joined the sport in his mid-30s, and is now a hall of famer. I think this video game can really inspire people to go out, get in shape, get fit, and maybe even compete themselves. Having played UFC Undisputed 2 before, what really stands out in this new game for you? What stands out? I would have to say my abs. My abs, definitely. I’m teasing. Just the game play. In UFC Undisputed 2, you can leg kick a guy a thousand times, and you see no difference in the guy’s performance. It wasn’t like a real ending blow. 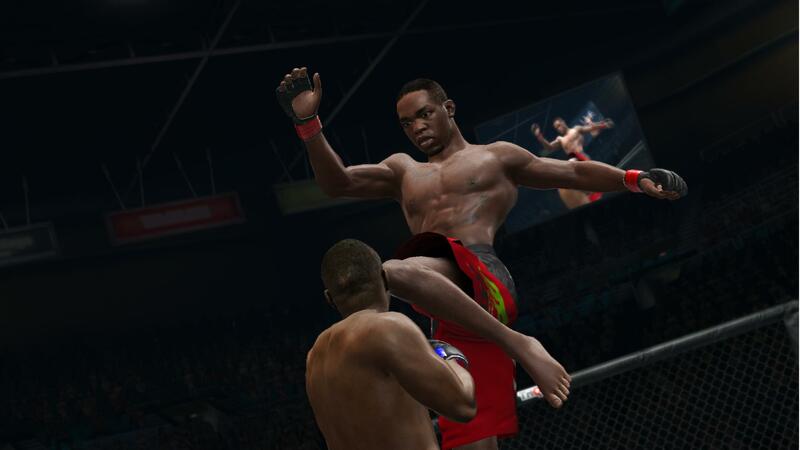 In real life, leg kicks are a huge part of martial arts; it slows down the game speed of the opponent tremendously. That’s a change that they’ve made in Undisputed 3. After maybe 10 or 13 leg kicks, you see your opponent starting to limp a little bit and his fatigue is going down dramatically. That’s the biggest difference. They just made it so much more realistic in every way. Do you feel that the realism of Undisputed 3 allows you to help train and prepare for your real fights? Totally, absolutely. I played a few employees at THQ today. People were playing as Rashad (Evans), and they all lost to me. So I think the game is pretty accurate.